If you’re looking for a family-friendly, engaging, and absolutely fun experience, book an escape room at The Escape Game during your next family vacation. It’s something that everyone can participate in – a few years ago our son at only 1 and half years old and was able to find clues and even help solve puzzles! *This post contains affiliate links. 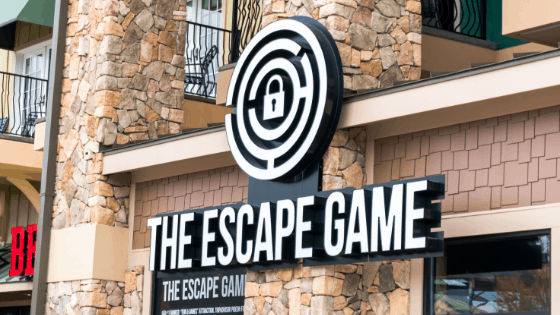 This post also contains sponsored content The Escape Game Pigeon Forge, Tennessee. All content and opinions are my own. An escape game is an interactive, puzzle and riddle-solving adventure that pushes logic and requires hands-on capabilities to escape the game within the 60 minute time fame. It’s a great experience for the whole family because it requires teamwork to solve riddles, puzzles, and communication skills. There are multiple games to choose from, they all have different themes, plots, and objectives. The games are all rated for difficulty so you can choose which game would be the best fit for your teammates. We played this game back in 2015, it was our first escape game we had ever tried. We were hooked! The game opened up communication skills, gave our children’s brains a workout (as well as our own! ), and gave us all a common objective, recover the stolen painting and escape before the curator returns! The difficulty rating for this game is 8/10 and it’s a good fit for 2 to 8 players. This game was a lot of fun for our family. Our son, age 3 at the time, really loved how interactive and he was able to find clues that we didn’t find! The difficulty level is 7/10 and an ideal game for 2 to 6 players. Your objective in this game is to find the hidden gold within the 60 minutes time period before the mob gets there first! It was a very engaging and fun experience to watch the family scramble to solve the puzzles and work together to find the gold. We absolutely loved this game! We were able to escape with around 8 minutes remaining, it was the best escape time we were able to achieve yet in an escape game! Mission: Mars is the newest addition to The Escape Game Pigeon Forge and it so much fun! You have 60 minutes to restore your spaceship and escape back to Earth before it’s too late. Its difficulty rating is 8/10 and it requires teamwork and great communication! Two to eight players can play this game, we played with two adults and two children. Everyone worked together to escape with a minute remaining… what a rush! Classified is the game that we played while visiting Tennessee this year. Your goal in this game is to uncover the details of a planned attack before it happens and stop it. The requirements for gameplay was exciting for the children and it’s a game that really puts your logic to the test! The difficulty rating for this game is 7/10 and it the player capacity ranges from 2 to 6 players. With 33 seconds left on the clock, we were able to stop the attack! We haven’t played this one yet but we definitely want to! We are waiting for our son to get a little older so that he can help with the requirements of this game – it’s rated 9/10 and two to eight players can play. The objective of this game is just as you would expect, escape your prison before the warden comes back! We have never had a bad experience! Every employee that we have come in contact with has been a very positive and friendly experience. Playing an escape game is already a lot of fun and definitely gets you excited but the staff that monitors the games and helps with clues are fantastic! Their lively disposition is welcoming and creates a wonderful and thrilling experience in every aspect of the game. From the time you sign the gameplay waivers for the experience until the end of the game, you will be in the presence of happy, helpful, and courteous staff members. To summarize, our family absolutely loves playing escape games. It encourages quality time, communication, and teamwork in a family-friendly setting. To find out more about the games offered and even book online, you can visit their website here for further details.